Follow the method for Rik's King blue Stilton but don't add any blue cheese. When you get to the pressing section leave the cheese under pressure for twice as long and with a heavier weight than suggested. As my recipe doesn't use as much salt this cheese should be eaten within a week of pressing. Looks great. Would it form a crust if kept for a while longer? Yes of course it would. it will harden on the outside naturally but you have to watch out for pathogens and wipe it with a vinegar rag if any occur. The job of an affineur is to ripen the cheese and some wash the cheese in wine everyday to get a good rind others with spices etc etc. the shop inside a week with the use of an accelerator called acelerase. I'm going to make up your Lancashire recipe today, it looks delicious, and Rik, I'll take some pictures and attempt to post them, but don't hold your breath! Here is my little hard cheese truckle. I is surprising what a day gives on the blue formation. I am tempted to open it to see what it is like. But I think I will see how it develops after a few weeks. That looks beautiful. Its overall much bluer than mine, but I haven't used the P. Roqueforti yet which I presume produces a better and faster blueing. I've taken delivery of a hard cheese mould, a camembert mould, P.Roq and P.Candidum and cheese mats (what a difference they make!). A cheese press is on its way, just had to have one, also I'd like to get to grips with some harder cheeses which needs more weight than couple of tins of cat food. I will post a cheddar for you and you can learn what cheddaring means. You can sustain the weight on your cheese with a press with my home made press I could give a sustained pressure of 200lbs over a couple of weeks and make a very fine closed cheese. I've just set off Franco's recipe with the addition of some cream and a smidgeon of calcium chloride. As you can tell I've gone into experimental mode. I'll use the cheese press (for the first time) and my new hard cheese mould, it's all too exciting! What a difference a cheese press makes! I'm hoping I've done this right, but I lined my mould with cloth before I put the curds in. I thought the curds might squidge out of the holes in the mould when under pressure if I didn't. It also gives me something to grip when I turn the cheese. Adding a little calcium chloride certainly improved the curds, and as there were more curds than I had mould space I stacked the camembert mould on top to take the excess. By this morning they had compressed to the top of the first mould so I could take the camembert mould away. Pictures to follow some time this weekend I hope. My local Tesco does a 3 year matured Canadian Vintage cheddar - it is divine! Canadian cheddar has a very good name and their vintage cheddar is excellent. and the longer you keep the cheese in the maturing cave the longer it is not earning money.....so this accounts for it's higher price. Jen .....I have a small set of bathroom scales and with my dumbell weights of 4x2kg and 4x1kg in various combinations I hang them on my weight arm and make a chart of the pressure pressing on the scales by the ram pushing down and mark the arm off accordingly. As I have a rather long weight arm almost 4 feet long ...I can get up to a pressure of 200lbs. 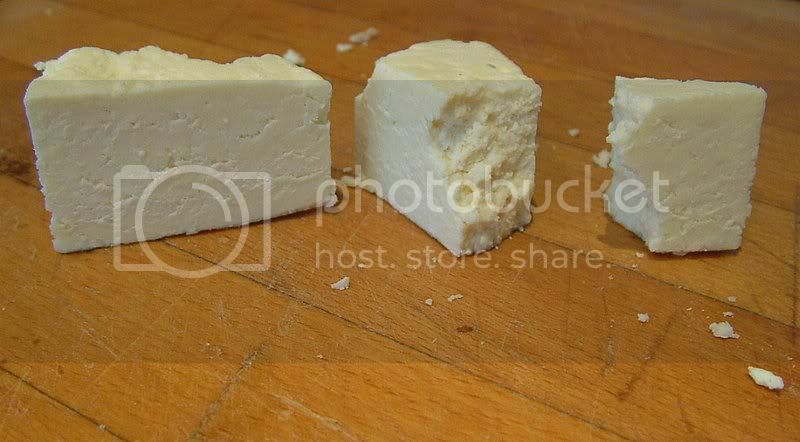 Mind you there is a formula for the pounds per square inch over a given area and this varies through the cheese and this is why we turn the cheese to even out the pressure. In the end it's all guess work but at least it is constant and repeatable. But your Lancashire looks very good. Did you salt it or brine bath it only with a brine bath it tends to make a good air dried rind. I don't think this little press would accomodate a set of scales, but my OH is a mathematician so he could probably work out the weight for me (in his head, in a trice). However, the press has produced a lovely firm cheese and I'm looking forward to trying it. I can see I'll have to make up a bigger version of this press in the future. Any chance of camembert and brie recipes, I've got the moulds ready and waiting. Can you run me through salting and brine bathing please? It has salt in it as per Franco's recipe.